Motorists paid £165m in parking fines last year largely because a lack of spaces has tempted more people to park illegally, a survey has shown. More than 32 million drivers are competing for just two million spaces in car parks. One in 10 drivers has received at least one fine in the past year. Questioning of 2,200 drivers by Privilege Insurance showed that one in three drivers parked illegally through sheer frustration. "It's frustration levels - parking rage - that pushes people into not caring that they are parking illegally," said Privilege business manager Catherine Alty. 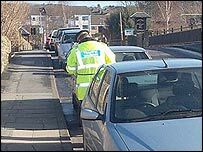 "It is inevitable that most drivers will get the odd parking fine every now and then, whether it is due to being in a rush and forgetting to pay or simply chancing their luck. "But our research shows the problem is so great that some people are prepared to get fined on a regular basis, and not just because the fine is less expensive than parking costs." The survey found that a two-hour stay in parts of London now costs more than £7 and motorists are tempted to risk a fine to avoid the charge. But some London authorities have started using cameras to crack down on parking offenders who take their chances if no traffic warden are in sight. Hotspots in Camden, Croydon, Fulham, Newham, Southwark and Hammersmith have adapted bus lane cameras to detect parked vehicles, with other areas likely to follow suit. Rebecca Rees, from motoring group the AA, told BBC News Online that fines alone are not enough and local authorities need to do more to cater for town centre motorists. "Cars are the lifeblood of local communities and if there is not enough parking or access for road users, high streets will go into decline. "Some of the revenue from fines could be used to provide more park and ride services or improve public transport, otherwise people will continue to choose out-of-town alternatives for shopping and leisure activities." Camden Council said the cameras are part of a larger Transport for London scheme to reduce traffic in bus lanes, where most of the cameras are positioned. "We have already had confirmation from London Buses that journey times have been improved and passenger satisfaction has gone up as a result," a spokesperson said. Bob Macnaughton, Chief Executive of National Car Parks insisted: "NCP's own analysis across its 600 sites nationwide shows that there isn't a crisis of spaces available in our off street car parks, and there is capacity for parking at any time of the day."